What is Supplier’s Credit ? Supplier’s Credit is a structure of financing import into India. In this structure, overseas suppliers or financial institutions outside India provide financing to importer on Libor linked rates against usance letter of credit (LC). Income Tax Return Form – ITR-4 (Sugam) is applicable to Resident Individuals, HUFs and Firms (other than LLP) having total income upto Rs. 50 Lakh and having Presumptive Business Income under sections 44AD or Presumptive Income from Profession under section 44ADA or Presumptive Income from Goods Carriages under section 44AE. Whether this return is being filed by a representative assessee? If Yes, then Name, Address, Capacity and PAN of the representative needs to be provided. Field for Nature of Employment has been added whether Govt, PSU, Pensioners or Others. Fields like Income Tax Ward / Circle, Whether Person governed by Portuguese Civil Code, Enter PAN of Spouse if applicable, Residential Status and Tax Status have been removed. Less : Allowances to the extent exempt u/s 10 (included in salary income above). Select from the list given for Nature of Exempt allowance. Provide Description If ‘Any Other’ is selected for Exempt Allowance. New insertion : Arrears/Unrealized Rent received during the year Less 30% under Income from House Property. Nature of Income from the list provided below is to be selected and amount is to be mentioned. Description is to be given If ‘Any Other’ is selected. For Example Tailoring income. Less: Deduction u/s 57(iia) (In case of family pension only). 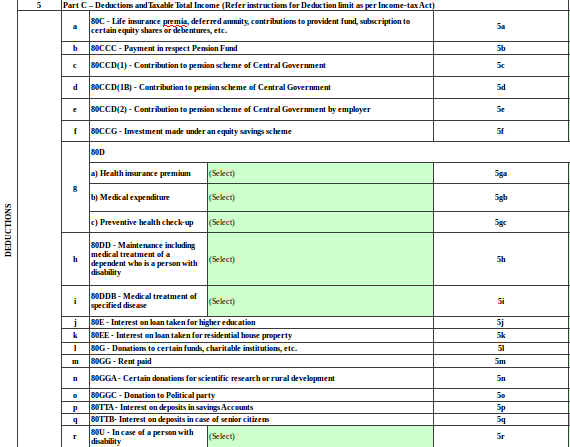 Headings of Various deduction sections from 80C to 80U has been clearly specified. a) Health insurance premium – Maximum limit Rs. 1,00,000.
b) Medical expenditure – Maximum limit Rs. 1,00,000.
c) Preventive health check-up – Maximum limit Rs. 5,000. Self or dependent – Maximum limit Rs. 40,000. Self or dependent-Senior Citizen – Maximum limit Rs. 1,00,000. Section 80QQB – Royalty income of authors of certain books has been removed. Section 80RRB – Royalty on patents has been removed. Section 80TTA – has been changed to Interest on deposits in saving bank Accounts from Income from Interest on saving bank Accounts. Corresponding Income offered – Gross Amount, Head of Income – Income from Business and Profession, Income from House Property, Income from Other Sources and Exempt Income. Old Column for TDS credit in the name of, Name of the Deductor / Name of the Tenant, Unique TDS Certificate No., Tax deducted and Amount claimed in the hands of spouse as per section 5A or any other person as per rule 37BA(2), have been removed. Item No. 21 Sch IT: Enter all the Advance tax and Self-Assessment tax details. Item No. 22 Sch TCS: Details of Tax Collected at Source [As per FORM 27D issued by the Collector(s)] : Column for amount claimed in the hands of spouse, if section 5A is applicable, has been removed. Field for Non-residents, who are claiming income-tax refund and not having bank account in India may, at their option, furnish the details of one foreign bank account has been removed. System Date will automatically get picked in Date column. Submission Date is available in the ITR-V / Acknowledgement generated after submission of return. Verification date is the date of Receipt of ITR -V at CPC. In case of e-verification, it is available in the Acknowledgement. Schedule for disclosure of Asset and Liability at the end of the year has been removed. Income Tax Return Form – ITR-1 (Sahaj) is applicable to only Resident Individuals having total income upto Rs. 50 lakhs, having Incomes from Salaries or Pension, One House property, Other sources (Interest etc. ), and agricultural income upto Rs.5,000. B. Less : Allowances to the extent exempt u/s 10 (included in salary income above). Select from the list given for Nature of Exempt allowance. Provide Description If ‘Any Other’ is selected for Exempt Allowance. Arrears/Unrealized Rent received during the year Less 30% under Income from House Property. Less: Deduction u/s 57(iia) (In case of family pension only). Kindly note this is a system calculated amount. Section 80TTA – has been changed to Interest on deposits in savings Accounts from Income from Interest on saving bank Accounts. It has been moved to Income Details Sheet from Taxes Paid and Verification Sheet Item no. 27. 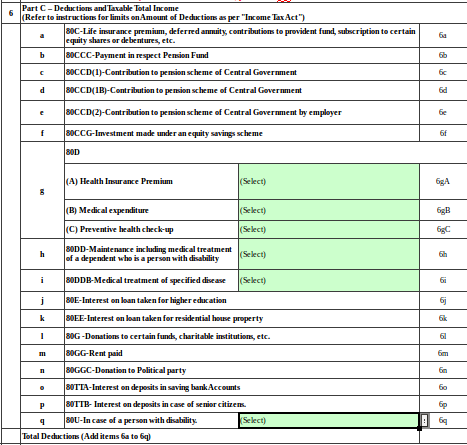 It has also specified the list of Nature of Income to be selected from exempt income under section 10, Agricultural Income, Defense Medical Disability Pension and Any other. Cases where the total income is less than Rs 2.5 lakhs, there is no late filing fee. Cases where the total income is above 2.5 lakhs but less than Rs 5 lakhs, late filing fee is Rs 1,000. Cases where the total income is Rs 5 lakhs and above, if the income tax return is filed after the due date (July 31, 2019) but on or before the December 31, 2019, there will be late filing fee of Rs 5,000. Cases where the total income is Rs 5 lakhs and above, if the return is filed after December 31, 2019 but on or before the March 31, 2020, there will be late filing fee of Rs 10,000. After March 31, 2020 the returns cannot be filed. Column (3) Gross receipt which is subject to tax deduction is to be provided in place of Amount which is subject to tax deduction. Column (6) TDS Credit out of (column 5) claimed this Year is to be provided in place of Amount out of (column 5) claimed this Year – It means out of the total tax deducted for the relevant year, how much is to be claimed in this assessment year. The remaining amount is allowed to be carried forward in future years. For example TDS deducted in FY 2018-19 is Rs. 200 and claimed in this year is Rs. 150, then amount in column 5 will be Rs. 200 and column 6 will be Rs. 150. Hence remaining Rs. 50 will be allowed to carried forward in next year. Item No. 22 TCS : Details of Tax Collected at Source [As per FORM 27D issued by the Collector(s)] : Column (3) Gross payment which is subject to tax collection is to be provided in place of Amount which is subject to tax collection. Column (6) TCS Credit out of (column 5) being claimed this Year is to be provided in place of Amount out of (column 5) being claimed this Year. Submission Date is available in the ITR -V / Acknowledgement generated after submission of return. Verification date is the date of Receipt of ITR -V at CPC. In case of e-verification, it is available in the Acknowledgement. Government issued an ordinance “The Banning of Unregulated Deposit Schemes Ordinance 2019” on 21 Feb 2019. What is Unregulated Deposit Scheme? “Unregulated Deposit Scheme” means a Scheme or an arrangement under which deposits are accepted or solicited by any deposit taker by way of business and which is not a Regulated Deposit Scheme. What is banned as per the Ordinance? All kinds of Unregulated Deposit Schemes are banned. No deposit taker shall solicit deposits or accept deposits in pursuance of an Unregulated Deposit Scheme. Any fraudulent default in the repayment of deposit or in rendering any specified service promised against such deposit in Unregulated Deposit Scheme. Any fraudulent default in the repayment or return of deposit on maturity or in rendering any specified service promised against such deposit in Regulated Deposit Scheme. Wrongful inducement in relation to Unregulated Deposit Schemes by one person to another person. A prize chit or a money circulation scheme banned under the provisions of the Prize Chits and Money Circulation Scheme (Banning) Act, 1978 shall be deemed to be an Unregulated Deposit Scheme as per the Ordinance. e.g. lottery system, kitty system. Why is Unregulated Deposit Banned? The objective is to curtail the menace of illicit Deposit Schemes. Curb Multi – level – marketing, Ponzi Schemes and Ponzi Companies that dupe people. This provision applies to any person who makes a deposit under this Ordinance like Individuals, Hindu Undivided Family, Proprietorship Concern, Partnership Firms, LLP, AOP, Trusts, Co-operative Society etc. It excludes Companies as Provisions of Acceptance of Deposits by Companies shall apply to them. All kinds of Unregulated Deposit Schemes are banned with immediate effect from February 21, 2019. i.e on and from the date of commencement of Banning of Unregulated Deposit Schemes Ordinance, 2019. How do I check whether my deposit is banned or not? If deposit given is excluded from the definition of Deposit: Ordinance doesn’t apply. If it is a ‘deposit’ under Regulated Deposit Scheme (RDS), which are issued by specified Regulators. : Ordinance doesn’t apply. If it is a deposit but doesn’t fall under Regulated Deposit Scheme (RDS) then it shall be termed as Unregulated Deposit Schemes (URDS). Then, Unregulated Deposit Scheme Ordinance, 2019 will apply. Provided that if the amounts received under items (i) to (iv) become refundable, such amounts shall be deemed to be deposits on the expiry of fifteen days from the date on which they become due for refund. Who is a Deposit taker? What is by way of business? By way of Business includes those cases where taking deposits constitute business itself. (i) SEBI (Collective Investment Scheme) Regulations, 1999. (ii) SEBI (Alternative Investment Funds) Regulations, 2012. (iii) SEBI (Portfolio Managers) Regulations, 1993. (iv) SEBI (Share Based Employee Benefits) Regulations, 2014 or providing for employee benefits under the Companies Act, 2013 (18 of 2013). (v) SEBI Act, 1992 (15 of 1992), or the regulations made there under. (vi) SEBI (Mutual Funds) Regulations, 1996. (ii) Funds are accepted by individuals or entities engaged as Business Correspondents and Facilitators by banks subject to the Guidelines and Circulars issued by the Reserve Bank of India from time to time. (iii) Funds are received by a system provider operating as an authorized payment system under the Payment and Settlement Systems Act, 2007 (51 of 2007). (iv) Any other scheme or an arrangement regulated under the Reserve Bank of India Act, 1934 (2 of1934), or the guidelines or circulars of the Reserve Bank of India. 3 The Insurance Regulatory Authority of India A contract of insurance pursuant to a certificate of registration obtained in accordance with the Insurance Act, 1938 (4 of 1938). (ii) Commenced or conducted as a chit business with the previous sanction of the State Government in accordance with the provisions of the Chit Funds Act, 1982 (40 of 1982). (iii) Regulated by any enactment relating to money lending which is for the time being in force in any State or Union territory. (iv) By a prize chit or money circulation scheme under section 11 of the Prize Chits and Money Circulation Schemes (Banning) Act, 1978 (43 of 1978). 5 National Housing Bank Any scheme or an arrangement for acceptance of deposits registered under the National Housing Bank Act, 1987 (53 of 1987). 6 Pension Fund Regulatory and Development Authority Any scheme or an arrangement under the Pension Fund Regulatory and Development Authority Act, 2013 (23 of 2013). 7 Employee Provident Fund Organization Any scheme, Pension Scheme or Insurance Scheme framed under the Employees’ Provident Fund and Miscellaneous Provisions Act, 1952 (19 of 1952). 8 Central Registrar, Multi State Co-operative Societies Any scheme or an arrangement for acceptance of deposits from voting members by a Multi-State Co-operative Society registered under the Multi-State Co-operative Societies Act, 2002 (39 of 2002). (i) Deposits accepted or permitted under the provisions of Chapter V of the Companies Act, 2013 (18 of 2013). (ii) Any scheme or an arrangement under which deposits are accepted by a company declared as a Nidhi or a Mutual Benefit Society under section 406 of the Companies Act, 2013 (18 of 2013). (ii) any other scheme as may be notified by the Central Government under this Act. Whether I can take loan from my friend for marriage, medical emergencies or personal purpose? Yes, as that amount will be spend for specified purpose and not used by way of business. Whether amount brought by partner as loan in his partnership firm be termed as deposits? Yes, amounts received by partner in the partnership firm is termed as deposit. But amounts received by any partnership firm by way of loan from the relatives of any of its partners is not a deposit. Whether amount brought by partner as loan in his partnership firm for running of the business be termed as Unregulated deposits? No, amount brought by partner as loan for running of the partnership firm’s business will not be Unregulated deposits. But that amount is used by way of business for further lending then it will be termed as Unregulated deposits and not permitted. What would happen to my existing deposits taken from non relatives before the Ordinance date? Such Deposits would definitely qualify as Unregulated Deposits but will not be impacted by the Ordinance until the promised repayment date. Renewal of such deposits will not be permitted as per the Ordinance. Whether the monthly Gold schemes run by the Jewellers be termed as Unregulated deposits? No. Such scheme allows an individual to deposit a sum of money every month for 10 or 6 months which can be redeemed against a jewellery purchase on maturity of the scheme. As such deposits are received in the course of business, it is excluded in the definition of deposits. Hence it is not governed by the Ordinance. In case where deposits are given by the clients to the share broking agencies, whether such deposits be termed as Unregulated deposits? Amount received by way of deposits from the clients is in direct connection to the business, hence it is not termed as Unregulated deposits. But cases where the share broking agencies are utilizing these amount for the purpose of further lending and earning interest thereon then such deposits shall be treated as Unregulated Deposits and then will be governed by the Ordinance. In last few years we have seen below news of Indian banks adopting blockchain. This article is focused on RippleNet xCurrent platform (used for Cross Border Payment), how does it work for corporate payment and retail payment, what is the benefit / limitation for exporters and importers, and what is the difference between Ripple Net and SWIFT. Competition in the cross-border payments market is on the rise between blockchain firm Ripple and payments messaging company SWIFT. Most importers / exporters are using SWIFT for making or receiving payment. Ripple on the other hand is relatively new in cross-border payment but is gaining popularity. What is Ripple Net xCurrent ? xCurrent is Ripple’s enterprise software solution that enables banks to instantly settle cross-border payments with end-to-end tracking. Using xCurrent, banks message each other in real-time to confirm payment details prior to initiating the transaction and to confirm delivery once it settles. How does Ripple xCurrent Work ? Faster Payment processing: It take around 4 sec to transfer payment where as in SWIFT usually the beneficiary would receive payment the next day. End to End tracking of transaction: Incase of swift, one has to follow up to get swift messages (MT103, MT202) based on which exporter can check with his bank on receipt of payment. In case of xCurrent, payment is made immediately and it allows end to end tracking. Attach Documents : In case of xCurrent, one can attach documents like invoice along with the payment message which is not allowed in SWIFT. Cost per transaction: Average correspondent bank charges using SWIFT is around $25 – $ 35 per transaction. RippleNet xCurrent is claiming to have low cost for the same. Lower failure rate: As all transactions are pre check (for account number with beneficiary bank details) before making payment, it results in lower failure rate. Limitation: With SWIFT, importer / exporter are able to make payment to any part of the world as most banks are connected with it. RippleNet xCurrent is still in process of adding banks and financial institutions around the world. So before making any payment importer / exporter will have to check whether beneficiary’s bank is on RippleNet or not. As of now in India only 5 banks have signed up for RippleNet which are Axis Bank, Yes Bank, Kotak Mahindra Bank, IndusInd Bank and Federal Bank. Facing competition, SWIFT launched new standards for handling cross-border payments in 2017 called SWIFT gpi. Over the years Indian importers have used Suppliers Credit and Buyers Credit as two different modes of Import financing. RBI had defined them as Trade Credit under Master Direction for ECB and Trade Credit. Suppliers Credit structure was understood as financing of import usance Letter of Credit (LC) by Overseas branches / Foreign banks where as Buyers Credit was considered as financing against LOU/LOC till it was stopped by RBI. Under new RBI Circular “Trade Credit : New Regulatory Guidelines” a confusion arose on what structure can be called Suppliers Credit ? In this article we will compare the trade credit circular, what is the confusion, what has changed in relation to suppliers credit, Impact on Local Bank and Overseas Branches and Impact on Importers. Definition of Trade Credit Trade Credits refer to the credits extended by the overseas supplier, bank and financial institution for maturity up to five years for imports into India. Depending on the source of finance, such trade credits include Suppliers’ Credit or Buyers’ Credit. Trade Credits (TC) refer to the credits extended by the overseas supplier, bank, financial institution and other permitted recognised lenders for maturity, as prescribed in this framework, for imports of capital/non-capital goods permissible under the Foreign Trade Policy of the Government of India. Definition of Suppliers Credit Suppliers’ credit relates to the credit for imports into India extended by the overseas supplier Depending on the source of finance, such Trade Credit include suppliers’ credit and buyers’ credit from recognised lenders. Definition of Buyers Credit Buyers’ credit refers to loans for payment of imports into India arranged by the importer from overseas bank or financial institution Depending on the source of finance, such Trade Credits include suppliers’ credit and buyers’ credit from recognised lenders. Recognised Lender for Suppliers Credit Overseas supplier, bank and financial institution For suppliers’ credit: Supplier of goods located outside India. Recognised Lender for Buyers Credit Overseas supplier, bank and financial institution Banks, financial institutions, foreign equity holder(s) located outside India and financial institutions in International Financial Services Centres located in India. 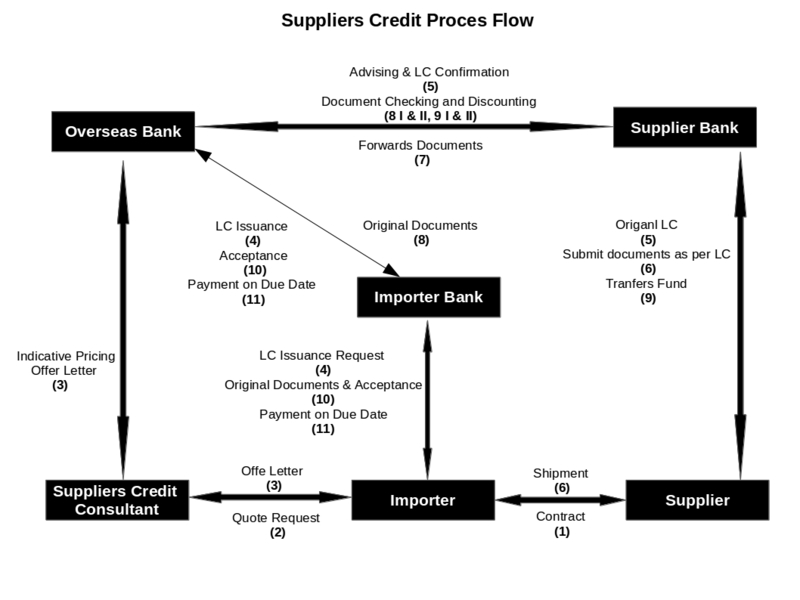 Source of finance defines whether it is suppliers credit or buyers credit. If an importer arranges finance against import usance LC from overseas branch, it will be classified as buyers credit. Supplier gives credit of 180 days on DA/usance LC etc., it will be considered as suppliers credit. Suppliers Credit: Supplier of goods is the recognized lender. Buyers Credit: Banks, financial institutions, foreign equity holder(s) located outside India and financial institutions in International Financial Services Centres located in India. What is the confusion ? Importers, Bank, and Overseas Branches over period of time started using terms Suppliers Credit for financing of import usance LC. Whether RBI has stopped suppliers credit as market new it (import usance LC finance). What is suppliers credit ? What will import usance LC financing product be called now? Whether the current structures of financing import usance LC will still remain ? No. RBI has not stopped import usance LC finance. Now it would be know by another name. Suppliers Credit means financing provided by supplier. If supplier gives 180 days credit for import under DA/usance LC, it will be consider as suppliers credit. Importer will have no roles as supplier is giving finance directly or arranging for finance and also bearing the cost of it. LC Backed Reimbursement Finance etc. Local Banks will have to change classification for reporting to RBI. From the perspective of importer there will be no change in process which they used to follow for arranging financing against import usance LC. Only thing they will have to get acquainted with new terminology which banks will use to give financing against it. In William Shakespeare’s words : “What’s in a name? That which we call a rose by any other word would smell as sweet”. Terminology used for Suppliers Credit will change but underlying structure will remain the same. Below given are RBI FAQs on Trade Credit updated as on 26- Dec-2018. RBI has issued revised guidelines under” Trade Credit : New Regulatory Framework“. Will update this article as when RBI updates the FAQs with revised guidelines. 1. Does discontinuance of LoU/ LoC mean that Trade Credit has been discontinued as a means of trade finance? No, Trade Credits, including Buyers’ Credit, can be availed as a form of clean credit apart from availing Bank Guarantee for Trade Credits, subject to extant Trade Credit guidelines and compliance with provisions contained in Department of Banking Regulation Master Circular No.DBR No. Dir. BC.11/13.03.00/2015-16 dated July 1, 2015 on “Guarantees and Co-acceptances”, as amended from time to time. Letters of Credit/ Bank Guarantee arrangements continue as a form of trade finance, as hitherto. 2. Do LoUs/ LoCs, which have been issued prior to issuance of A.P. (DIR Series) Circular No.20 dated March 13, 2018, but whose tenor is not over need to be cancelled? No, LoUs/ LoCs issued and accepted prior to the issuance of the said circular may continue till their original validity. However, no roll-over is permitted. 3. Whether SBLC can be issued by AD Category branches on behalf of their customers for availing short term trade finance from overseas lenders in Foreign currency? AD banks can issue SBLC on behalf of their customers for availing short term trade credit from overseas lenders in foreign currency subject to such SBLCs complying with the provisions contained in Department of Banking Regulation Master Circular No. DBR. No. Dir. BC.11/13.03.00/2015-16 dated July 1, 2015 on “Guarantees and Co-acceptances”, as amended from time to time. As discussed in the earlier article, RBI issued a circular related to Trade Credit – New Regulatory Framework which has provided clarity on many aspects of Trade credit (Buyers Credit / Suppliers Credit). One of this aspect is All-in-Cost Ceiling. This article is about All-in-Cost definition, relevant extracts of RBI circular, what has changed and what will be its impact on trade credit products offered by banks. As discussed in earlier article, RBI issued a circular related to Trade Credit – New Regulatory Framework which has provided clarity on many aspects of Trade credit. One of the aspect is Trade Credit (Buyers Credit / Suppliers Credit) availed by units based in SEZ/FTWZ/DTA. In this article we have provided relevant extracts related to SEZ/FTWZ/DTA, definition, documentation and process to be followed by developers and units. RBI has issued a new regulatory framework for Trade Credit (TC) on March 13, 2019 effective immediately. Details of the circular is given below. In next articles we will cover the major changes in the RBI circular. What be termed as Suppliers Credit ? As per the new circular Only those finance provided by Supplier of goods located outside India can be termed as suppliers credit. Some example finance provided by supplier can be DA Document or Usance LC for 180 days etc. Import Usance LC finance arrange by importer will hence forth be called UPAS, LC backed Reimbursement Finance, or LC Discounting or any other term given by local / overseas branches. Banks can issue Bank Guarantee for availing trade credit. Few private sector banks earlier where insisting on giving SBLC to only their overseas branches for trade credit. But with this circular understanding should be that banks can now issue guarantee / SBLC to any overseas banks / branches, FI, Foreign Equity holder and IFSC Branches. The directions on issuance of guarantee mentioned under this provision shall come into force from the date of publication, in the Official Gazette, of the relative Regulations issued under FEMA. As of 18-Dec-2019, above Gazette is yet to be issued. Changes in all-in-cost ceiling and definition. Foreign branches / subsidiaries of Indian banks are permitted as recognised lenders only for Foreign Currency Trade Credit. Option for 5 year trade credit has been removed. Non-banking financial companies (operating from IFSCs) will now be able provide trade credit. Another header created in amount for which Trade Credit can be availed by oil/gas refining & marketing, airline and shipping companies. Per Transaction Maximum Amount permissible will be USD 150 Million. Policy to avail trade credit for Shipyard and Shipbuilder. New Definition of all in costing pricing (It includes rate of interest, other fees, expenses, charges, guarantee fees whether paid in foreign currency or INR). Thus would it mean 6 Month + 250 bps would also included bank guarantee fee charged by local bank ? Change of Currency of borrowing. Policy and process of Trade Credit related to SEZ, FTWZ and DTA. Security which can been offered for Trade Credit, creation of charge and related process. Authorised Dealer (AD) Banks to decide on formats or manner in which Trade Credit arrangements / loan agreements are to be documented. Role of Local Banks in Trade Credit. Procedure in case of Invocation of Guarantee. What importers will have to do henceforth to avail buyers credit / trade credit. What will be changes in accounting treatment for buyers credit against Bank Guarantee in importers books of account. In the earlier articles we have discussed about documents required under letter of credit (LC) and how to prepare and submit compliant document. In this article we will discuss about, what is Negotiable Bill of Lading, Why endorsement is required, who should endorse and what are the endorsements required. In the earlier articles, we have discussed about LC format MT700, and how to prepare and check documents under LC. This article provides a checklist for exporter after Letter of Credit (LC) is opened before shipment of goods. This will help exporter better understand the details in LC and whether exporter will be able to comply with its terms. If not, exporter should ask to get amendment in relevant clause. Where ever possible exporter should ask for a draft copy of LC to check terms, so as to avoid amendments after LC is opened. Check name of issuing bank (swift code) and if its a trustworthy bank. How is the experience of others exporters in dealing with this issuing bank. In case of financing requirement, check if exporter’s bank has lines of the issuing bank. Check if deadlines mentioned is acceptable. It is advisable to have margin in date of shipment and expiry to avoid requirement of amendment in LC. Verify the expiry location of the letter of credit. “Field 31D: Date and Place of Expiry” and “Field 41A: Available With … By …”. Both should be preferable in country of exporter. As per RBI Master Direction “Export of Goods and Services”, exporters are expected to present export documents within 21 days of shipment. Thus LC should preferably mention 21 days. Incase of more than 21 days, banks may handle them provided they are satisfied with the reasons for the delay. It is advisable to clarify the same with exporter’s bank. Name and Address of Beneficiary (59) and Applicant (50) are correctly stated. Mention of performa invoice or underlying contract should be avoided. If CIP or CIF incoterm is used, insurance document requirement to be mentioned in 46A. Where is the claim payable. Insurance to cover from which point to which point. Negotiation Clause (41A): Is LC restricted or available with any bank? Based on arrangement of exporter with existing bank or negotiating bank, it will help arrange pre shipment &/or post shipment finance. Number of original and copy required. Type of transport documents required. Type of Insurance documents required. Clause requiring applicant documents : LC should avoid clauses requiring documents that are to be issued, signed or countersigned by the applicant. Beneficiary Certificate: Such clause can be avoided. All documents to require LC number can be avoided. Check if any clause of UCP600 has been excluded or not. If excluded, understand its impact on exporter. Port of discharge is consistent with sales contract. Understand and determine which fees must be paid by the exporter according to the letter of credit conditions. “Courier Fee / Postage Fee”, “Advising Fee”, “Discrepancy Fee”, “Handling Fee / Negotiation Fee”, “Amendment Commission”, “Confirmation Fee”, “Reimbursing Bank Charges”. Transhipments (43T): Preferable, it should be allowed. Confirmation Status (49): Is it confirmed LC or has an option for adding confirmation and who will bare the cost of the same. This field will have these three options: Confirmed, Without, May Add. If case where the LC is already confirmed where is confirming bank located. Above is not a comprehensive list. Depending on type of goods exported and countries to which it is exported, requirement of clauses and document may differ. If you do not understand or have any queries in any of the above clauses or terms, you can get in touch with us. This article is about Buyers Credit Against Standby Letter of Credit (SBLC), its meaning, process flow, documents required, costing, applicable rules, issues with the current structure and what should importer do to avail it. RBI revised Foreign Exchange Management (Borrowing and Lending) Regulations, 2018 on December 17, 2018 (link in reference). Revision is made to ECB guidelines, Trade Credit, borrowing by banks outside India and others. This articles covers changes made to Trade Credit guidelines. The Hindu Business Line Published our report on Buyers Credit Outstanding going down by $25 Billion on today’s front page. What was the outstanding amount of buyers credit in overseas branches of Indian Bank as RBI data did not provide bifurcation products wise ? What is the run down in books of these bank since 13 March 2018 RBI Circular ? What is its impact on Libor based finance available to Indian importers ? In this article we have provided the data and analysis which will answer the first two questions. Why are Indian Banks Closing Overseas Branches ? Indian Banks have closed 37 Overseas branches till date and another 60 – 70 branches are under review. This article gives an overall summary of Indian banks presence internationally, reason for reducing number of branches and bankwise update on branches closed or in process of closing. SWIFT system is used for Bank to Bank communication and Bank to Corporate communication. There are different type of Swift messages format related to specific purpose. This article focuses on Category 7 message. Income Tax Return Form – 1 (Sahaj) is applicable to only Resident Individuals having Incomes from Salaries or Pension, One House property, Other sources and having total income upto Rs. 50 lakhs. The new ITR-1 form is not applicable to Non-residents and Residents but not ordinarily resident (RNOR). Nature of Business or Profession Code is required to be furnished in ITR 3, ITR 4, ITR 5 and ITR 6. In the new Income tax return (ITR) forms for A.Y 2018-19, below changes are made in Nature of Business or Profession Codes. What is Legal Entity Identifier (LEI) ? The LEI is a 20-digit, alpha-numeric code that identifies legal entities participating in financial transactions. Each LEI is unique and contains reference information that enables simple and quick identification of an entity. As an international standard (based on ISO 17442), all LEI information is openly published and accessible to all. As per Rule 96 of the CGST Rules 2017, the shipping bill filed by an exporter shall be deemed to be an application for refund of integrated tax paid on the goods exported out of India. Being so, opting LUT/NA or mentioning “0” against “IGST Paid” field, will keep away the exporter to avail refund claim even if they have paid the IGST as the exporter himself has declared the same in the Shipping Bill. However, following Circular No. 8/2018-Cus dated 23.03.2018, an option has been made available by the DG Systems in ICES for sanctioning IGST refund in respect of those cases where the exporter has erroneously declared that the shipment is without payment of IGST, although they have declared and paid the IGST in GST Returns. The due date for furnishing Statement of Financial Transaction (SFT) for Financial Year 2017-18 is May 31, 2018. An industry-wide practice that worked well until the end of business hours on Tuesday, which allowed D Dhanasekaran’s Tiruppur-based textiles firm — Abi Tex Mills — import machinery from Oman and boost production, has now gone haywire with the Reserve Bank of India’s (RBI) decision to bar banks from issuing guarantees in the form of letters of undertaking (LoUs) and letters of comfort. “My machinery took a year to be imported and has been installed in the factory for a few months now. But now with buyer’s credit cancelled, I am focused on how to make payments instead of my production,” Dhanasekaran said. MUMBAI (Reuters) – The Indian central bank’s move to cut off a key form of trade finance in the aftermath of a multi-billion dollar fraud could both dent the rupee and sharply raise costs for many importers, bankers and traders said. Latest RBI Circular : RBI stops Buyers Credit. As is circular copy given below. Please refer bold section. Inspection by RBI (annual basis). In relation to buyers credit transaction, below are the few audit point which are covered by above audits. “It is an active participant in the secondary market for buyer’s credit transactions and it has sold “all the referred transactions’’. This article tries to throw some light on what is buyers credit secondary market, how the structure works and why banks do transaction in secondary market. RBI in its 2016 Circular to banks had mentioned problem in relation to process followed for issue and reconciliation of SWIFT messages related to Trade finance products and corrective actions banks should take to prevent any fraud. Worth a read. This article gives layman summary of the PNB fraud case and its impact on buyers credit product and various stake holders like Indian Bank Overseas Branches, Local Banks in India and Importers. In earlier article “WHT (Withholding Tax) on Interest on Buyers Credit” and “Withholding Tax (WHT) on Suppliers Credit Transaction”, we had discussed that if buyers credit or suppliers credit is arranged from Mauritius based bank / branches, there was no withholding tax on interest payment as per Double Taxation Avoidance Agreements (DTAA). India-Mauritius Tax Treaty was amended on 10 May 2016 and got effective from 01 April 2017. In this article, only amendment related to Interest Payment (Article 11) is covered. In earlier article we have discussed about various aspect of Libor and its Impact on buyers credit transaction. In brief, Libor attempts to answer a fundamental question: What is the cost of money? It does this for a range of currencies (dollars, euros, pounds, etc.) and for a range of maturities. Recently a query from importer came in after buyers credit transaction was funded for replacing the underlying import document with another document. Currency fluctuation is one of the factor effecting Buyers Credit. 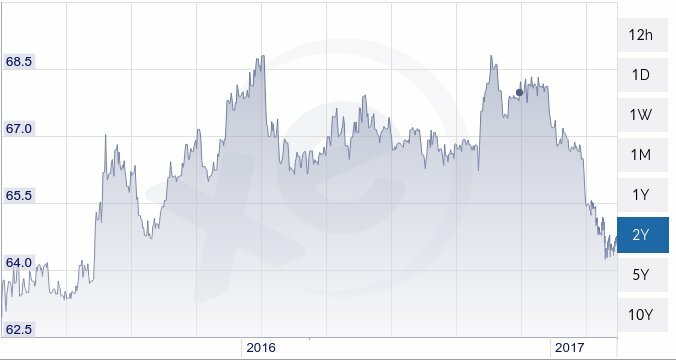 From 62 Level starting 2015, USD INR moved to 68 levels and since then has come back to 64 levels in 2017. This article explores impact of stronger rupee on importers who have availed buyers credit. What is Nostro Account ? As per RBI Master Direction on External Commercial Borrowing and Trade Credit banks are allowed to sanction buyers credit on import of capital goods for 3 years with Letter of Undertaking. Buyers Credit transactions are funded on Libor rates. Thus any change in Libor directly impact overall costing of the transaction. Libor rates started rising in 2015 and pace of which got picked up since beginning of 2017. Below 3 Month Libor and 6 Month Libor charts shows the trend. There are two charts for two range. Can I take buyer credit quote of 12M+LIBOR for capital goods import. Is there any specified guidelines that we have to take 6M+LIBOR / 3M+LIBOR only.